My Cluttered Corner: First Monday of Fall? I know many people are already experiencing Fall weather. I definitely miss that season. The colors, the scents and the crisp temperatures. We don't really get a fall season here at all. On Saturday we went to a birthday for a friend of Little Miss. It was at a local farm where the kids were able to go on pony rides, feed some animals, pet some goats and bounce on an inflatable castle. Lots of fun, but it was 107 degrees. Even in the shade. We kept pumping them with water and juice but they still got very red and sweaty faces after just a little while of play. We did get some cute pictures though. And since it is Monday, the new ScrapTiffany challenge is posted. This week's challenge was to do a back to school layout. I remember having 3 full months of summer growing up and not going back until after Labor Day. I guess many places still follow that schedule, but for us back to school time is mid August. I think they figure it is so hot here during the summer that everyone starts getting bored of being cooped up inside so they might as well go back to school! So, these pictures are from a few weeks ago when Little Miss started Pre-K. I have already scrapped these pictures and will probably scrap them again before I am done with them. Each time I try and take a different angle so I am telling different parts of the story. In this recent layout I talked about her new classroom. In this new layout I documented how well her first day went. The brown letter stickers, all the papers and journaling spot where I stamped the apple are Jillibean Soup products. I also added some basic office supplies including a green rubber band, staples and a pencil. 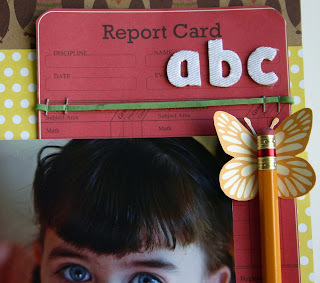 Go on over to ScrapTiffany and check out everyone's Back to School layouts. And don't forget to email your take on the challenge to Tiffany for your chance to be a Guest Designer in October! Also, go over to the Ruby Rock-it blog. I have a layout up there! 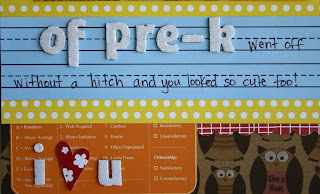 And last, but not least, I have a new layout and blog post up at the Posh Designs Scrapbook Store Blog. Go check it out here! You KNOW how much I love that LO! Great pics from the party, too!! I can't get over your little girl's blue eyes, just gorgeous. I just bought some of the new Jillibean Soup papers and can't wait to use them on a a layout. Great pics and fabulous layout. 107 degrees!!!!WOW. Still looks like the kids had a blast. Look at these pics. Awesome day. The kids must have so much fun! Wow, a pencil! I'd never have thought to do that....very creative thinking! Awesome LO's gf! 107 degrees, wow!!! Love the layout. The pencil is such a great touch. She is adorable! Such a cute layout! I love the creative idea of using the rubber band! Very cute papers and cute page. Such an adorable little girl! LOVE, LOVE, LOVE this LO!!! So incredibly cute!!!! love your back to school layout! Just adorable!